This week! We jump up to the great state of Washington to highlight another fantastic west-coast market, the Poulsbo Farmers Market! Market manager, Rachael Cleveland shared with us all the ways Poulsbo FM has become a beloved community fixture for over a decade! Farmers Market Coalition: Give us the scoop on Poulsbo Farmers Market. 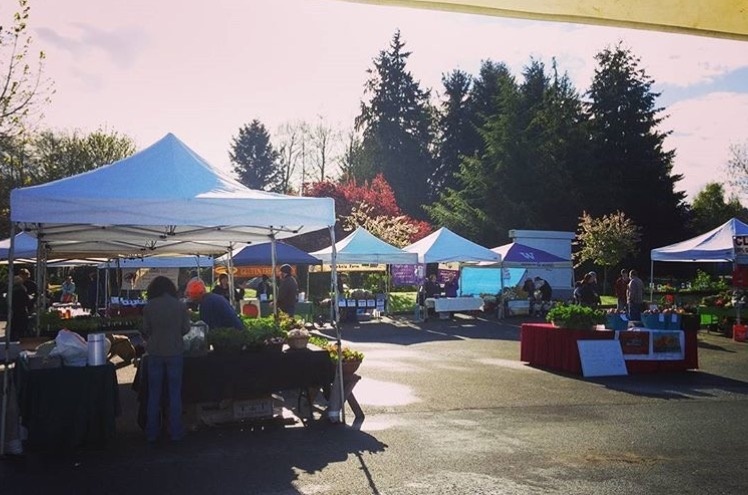 Rachael Cleveland: The Poulsbo Farmers Market just started its 13th season ever in a new and more prominent location overlooking beautiful Liberty Bay in Poulsbo, WA. It is run by a working board, two paid staff, and helpful volunteers. We averaged around 35 vendors per week, and are open from the first Saturday in April until the Saturday before Christmas. We have one of the longest seasons in our area, and pride ourselves on our amazing vendors. We really emphasize the value of handmade and locally grown products, and some of our vendors actually grown within a couple of miles of the market. Our vendors are dedicated; several have been with us since day one! We’re an outdoor market tucked in the side of a large residential neighbor, but near downtown in a small city of 10,000 people. We operate one location on Saturdays, and we take pride in being out there rain or shine for most the year. Poulsbo is known as “Little Norway,” and our downtown is very picturesque with its Norwegian architecture and designs. Our county has the highest percentage of small farmers in the entire state of Washington, and we see that crafty, homegrown passion in our vendors, their products, and their displays. We have a strong crew of regular shoppers who rely on the market for healthy produce, but we also love our tourists who walk up from the marina during the summertime. Poulsbo is a beautiful, welcoming place, and we’re thrilled to be here! FMC: What does Poulsbo Farmers Market do to support your community? RC: We really want to emphasize the community aspect of our market, and we do that several ways. We accept SNAP benefits and will be starting a Fresh Bucks matching program for that this year. Many farmers also accept WIC and Senior farmers market vouchers. We welcome local community groups. We schedule regular cooking demos called “Taste of the Market,” that feature the freshest produce from our farmers made on-site. Our “Market U” program teaches the public important gardening, food preservation, and animal husbandry skills once a month. We’re also known for live music, and will be offering acoustic music through the season. Starting this year, we’ll offer a weekly kids’ booth to help children learn more about fresh produce and how to use it. All of that is in addition to our 4 on-site events during the year, including a big Opening Day celebration with our Mayor and local royalty, a Kids’ Fest, a Tomato Taste-Off, and a Pumpkin Party! We usually have at least one off-site fundraiser dinner or event, too. Much of our behind-the-scenes effort goes into coordinating these programs, and helping our community learn how we can serve them. It’s a lot of fun! FMC: How do you promote what’s going on at Poulsbo? RC: Each Fall, we put out a call for artwork from the community that is added to our annual poster and postcard as that season’s market art. These are generally very colorful and vivid graphics, and the posters are distributed all over town. We have many customers who collect the posters, and they’re on display in our local City Hall! We also put up signs all around town with hours and arrows. Especially since we relocated this year, we’re working extra hard to make sure people know where to find us. We have about 20 physical signs (a-boards, etc) and 4 vinyl banners we set up before each market day, and they’re a huge help. One of our biggest efforts, and most successful, is social media! Our Facebook page is one of our main marketing outlets, and we have a large following. We introduced Instagram in early 2015, and love using that outlet to connect with farmers and customers alike. We also have an e-newsletter that goes out weekly, which lets customers know about different offerings the vendors are bringing and any special news we want to share. This is a great way to connect with our most devoted customers, and is one of our favorite ways to get the word out there! FMC: What are some of the challenges Poulsbo has faced? RC: After 12 seasons, we’ve experienced a bit of everything! We’ve extended our hours AND season, moved to a new location, and gone through staff changes just like every other market. We are one of 3 Saturday markets just in the northern part of our county, and we work hard to make sure we’re a destination for customers to attend. Most recently, we relocated to a new spot, and we’re still working through all of the kinks of being in somewhere unfamiliar. We’re so thankful to be on our 13th season, to be so closely linked to our amazing community, and to be in sincere conversation about establishing a permanent home for a potentially year-round market! FMC: Time to gush! What does Poulsbo really take pride in? RC: The most beautiful thing about the Poulsbo Farmers Market is all of the people – vendors, Board, staff, volunteers, and customers. The tomatoes are delicious, yes, but the people will get to you. Our market fosters personal and professional growth. We take pride in connecting local businesses with a large customer base, and many of our vendors have moved onto physical storefronts and self-sustaining businesses. There are people who’ve been involved with this market since the very beginning, and the love and appreciation for the Poulsbo Farmers Market runs deep in this community. It’s very touching, and we’re so thankful for that passion! Also, if you’re ever in need of the most delicious strawberry, reddest tomato, or plushest greens, come on out to Poulsbo. We’re happy to help! Hop on over to Instagram and follow their story!